Infinio releasing today already the third release of their acceleration product. I have covered the previous release in my detailed post here. 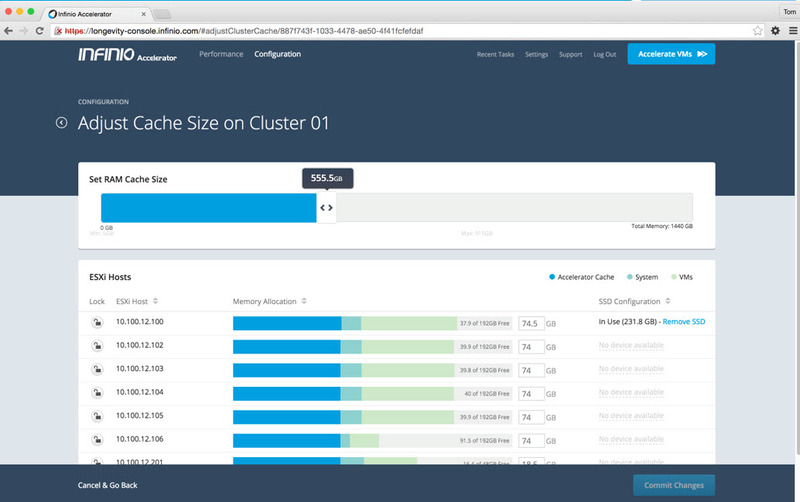 The Infinio Accelerator 3.0 can accelerate workloads on SAN, NAS, DAS, for VSAN, VMFS, vVols (includes HCI) and it uses RAM and SSDs caching. 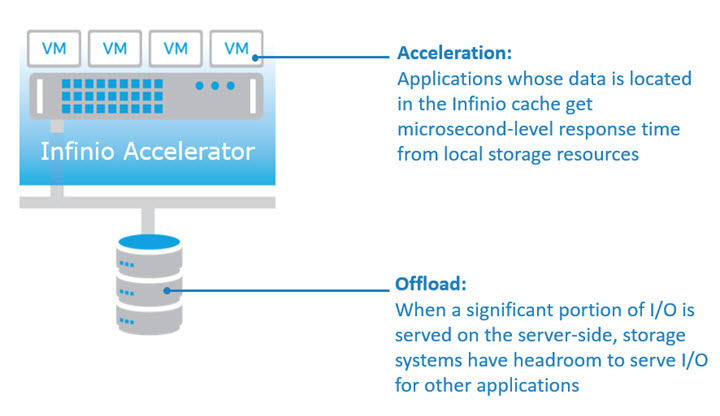 Infinio Accelerator 3.0 Now on VAIO Framework with up to 1,000,000 IOPS per host. VMware VAIO stands for “vSphere APIs for IO Filtering”. 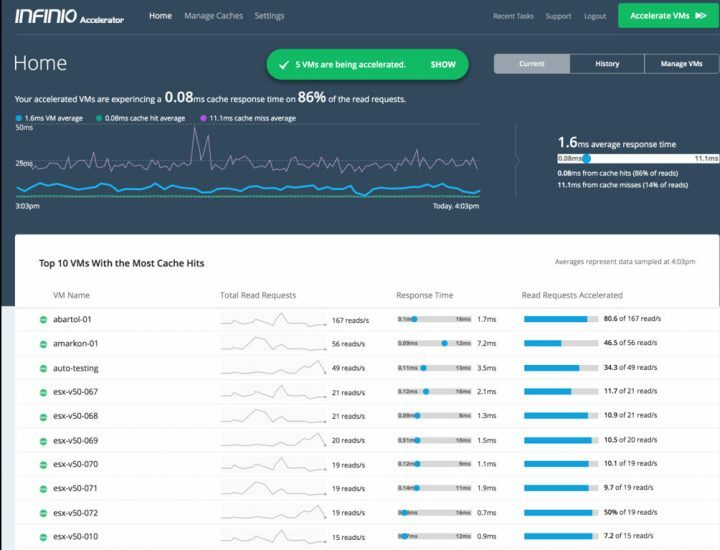 It’s a new API framework technology present in vSphere 6.0 (6.0 U1 more precisely) allowing vendors to present capabilities for caching and replication to individual VMs. It’s a framework, not feature. VAIO can be used not only caching but also for replication. Infinio is one of the first (or even the first one AFAIK) vendors actually building a new product that uses this technology. From the VAIO developers page here we can learn that it’s a policy-driven solution. The data services are surfaced through storage policy based management control plane (like for VSAN or VVOLs for example) and allow to govern per-VM or per-vmdk granularity on those services. Infinio provides the fastest and the most secure way to intercept I/O coming from a VM. An I/O filter installed on all ESXi hosts, then related storage policy is applied to each VM that will be accelerated. RAM as the Fastest medium, then Flash – a copy of the hottest data goes to RAM. Up to 1 Tb of RAM. When the data gets colder, they are moved to Flash. Tier 0 for RAM and Tier 1 for SSD. Up to 8Tb of Flash, up to 64 hosts. Inline Deduplication – all local storage resources are used as efficiently as possible. Each node stores only one copy of each block of data. The dedupe rates from 5X – 10X which yields by better utilization for any storage media such as RAM or flash. Raw Performance – 1.000.000 IOPS per host, 80 μs, 20GB/sec of throughput. 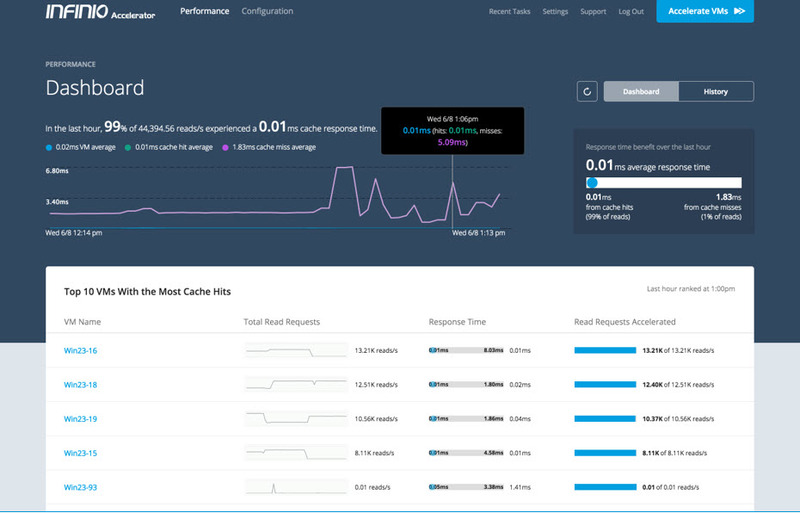 VM-level Acceleration – Applications whose data is located in the Infinio cache get microsecond-level response time from local storage resources. Built on VAIO – I/O filter installed on all ESX hosts, then related storage policy is applied to each VM that will be accelerated. Better performance than a cache VM or PSP, Supports any type of storage: SAN, NAS, DAS, for VSAN, VMFS, vVols (includes HCI). 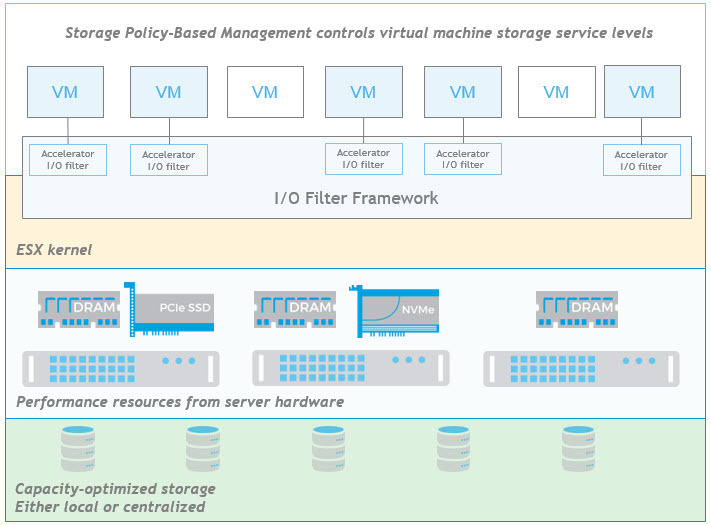 Integration with Storage Policy-Based Management. Software certified for VAIO framework has the highest level of certification – VMware Ready. Other caching solutions can obtain at maximum VMware Partner verified and supported product only. You might ask, What’s the difference? 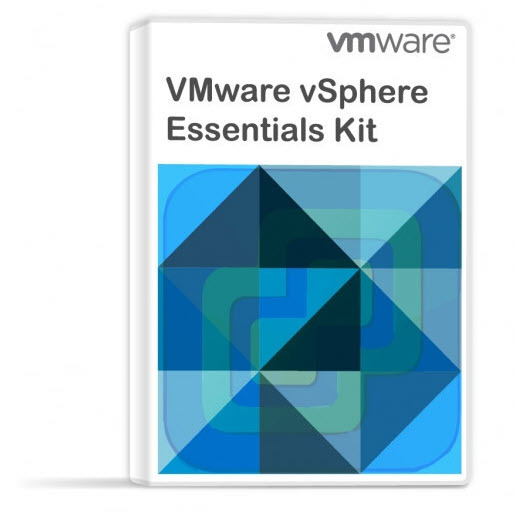 Well, there is, in case if you need support from VMware, for example…. Then the VMware ready certification, the customer does not need to prove that the third party caching software is not causing the problem. Badly behaving caching software might cause problems, but VAIO designed software due to the design, won’t. VAIO is the way to go for vSphere 6.x and onwards! The VAIO Framework (Img. courtesy of VMware) … You can also check detailed post on VAIO technology here. Any VMware supported datastore: SAN, NAS, and DAS, with VMFS, VVOLs, and vSAN. How about the cache size? The Infinio architecture is built for the use of both RAM and persistent media. When performance is of the utmost concern, RAM is the best option for performance, operating at speeds 100X that of flash. Infinio has always designed around a memory-first approach to caching, in particular by including industry-leading inline deduplication. Using this technology, many organizations have seen significant performance gains with just 16-24GB of RAM. The cache is composed of RAM and SSDs present in the cluster. Here is a view …. Infinio Accelerator isn’t a kernel module like PernixData. VAIO framework started to be part of vSphere only in vSphere 6.0 U1 but Infinio needs 6.0 U2 (the latest vSphere version). Infinio’s software enables the use of server-side RAM and flash to be transparent to storage environments, supporting the use of native storage features like snapshots and clones, as well as VMware integrations like VAAI and DRS. 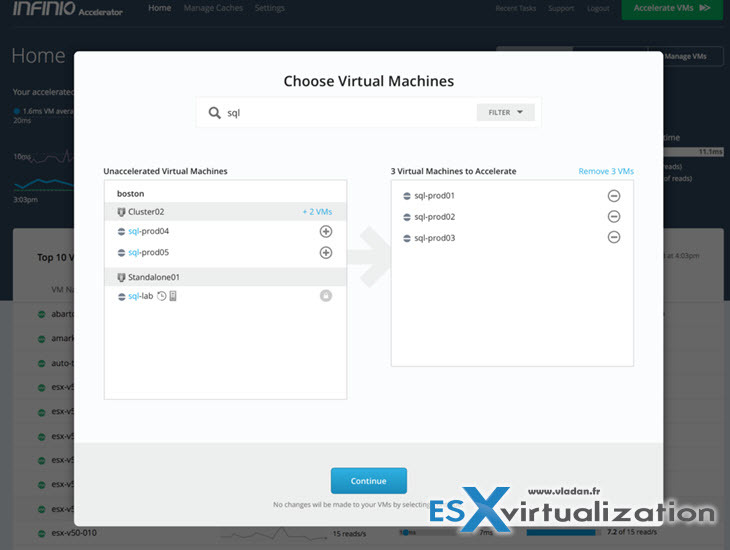 All VMware features are compatible – DRS, SDRS, VAAI and vMotion. Installation of Infinio takes 15 minutes and does not require any host reboot or data migration. Check out Infinio! 1. Does it improve write performance at all or is that write through? 2. Does the dedup only apply to the cache layer or the underlying storage? ie. does it actually reduce the original storage at rest? 3. how much resource is actually required per host to give such great performance? Hi Robbie, Sheryl here, from Infinio. 2. We only deduplicate the cache layer. We never change the format of data on disk, which is why it’s seamless to turn Infinio on and off for individual VMs at any point. 3. Most customers estimate it to be low single digits for CPU utilization. For memory, we support 8GB to 1TB per host, with most customers choosing 32GB-128GB. For SSDs, it varies a lot by workload. We encourage you to get in touch if you have any further questions or would like to trial the software – we have a 30-day fully-featured trial that installs in 15 minutes with no downtime.